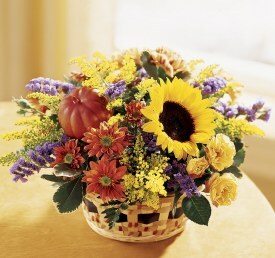 The following offerings are available anywhere in the US or Canada through FTD. 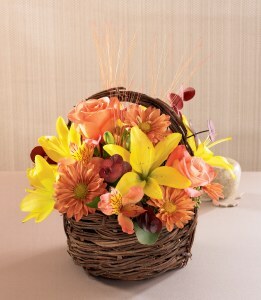 Prices quoted below are for the average price for the arrangement shown in a medium range. 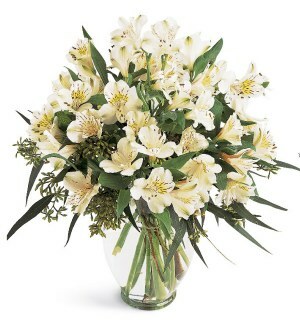 The final cost may vary depending upon where the flowers are delivered, the time of year and the possibility of added delivery or wire service fees. We offer daily delivery in Hopkinsville, Ft Campbell, Oak Grove, Pembrook or Lafayette Kentucky or can wire your order to anywhere in the world through FTD. 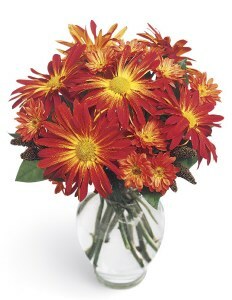 FTD B6-4112 Bright Autumn Centerpiece. 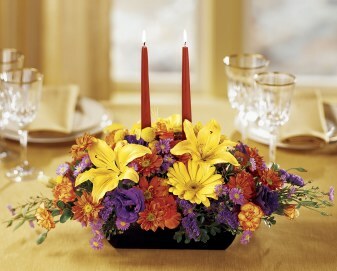 Asiatic lillies, Gerbera daisy's, fall tones Pom Pom Mums and seeded Eucalyptus accented with orange taper candles. 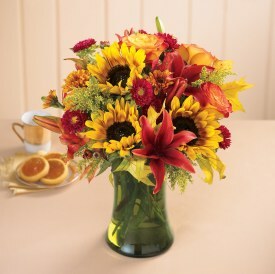 Sure to brighten up anyone's Fall table. 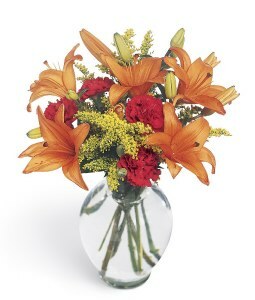 Daily local deliveries to Hopkinsville, Ft Campbell , Oak Grove, Kelly and Pembroke Kentucky. 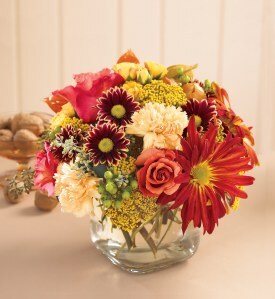 We can also wire flower arrangements anywhere in the world for you through the "FTD wire service or the "Florist Shop Network". 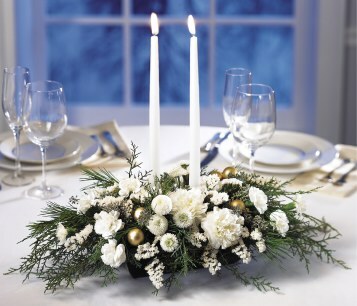 in a clear glass vase with fragrant holiday greens and seeded Eucalyptus. of the two 12" pillar candles that reflect off the gold glass ball ornaments. blue Delphiniums. 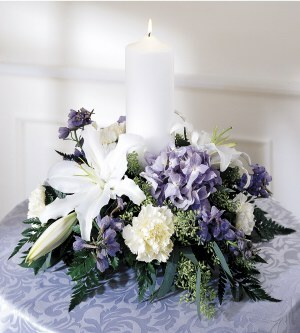 A tall white pillar candles adds a soft glow to your table. 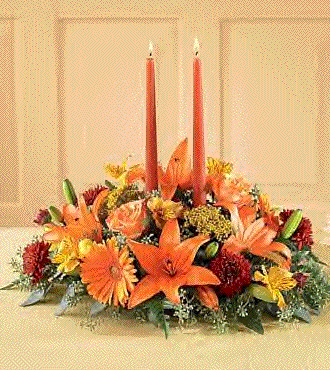 FTD B12-3099 Festive Season Arrangement. 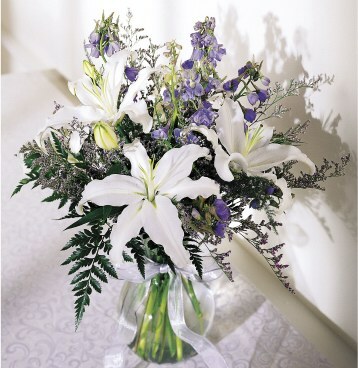 Celebrate Chanukah or Christmas in style with this simple but elegant glass vase of Oriental Lilies, blue Delphiniums. blue Caspia and greens accented with a sheer ribbon bow.